Ramses the Great, the Republic of Venice, Napoleon III, John D. Rockefeller Jr, the University of Harvard. The history of architecture can also be read as the history of its commissioners – from small renovations of private buildings to the capitals of nations, visionary patrons have for millennia relied on architects to erect the physical, inhabitable manifestations of their might, fortune, ambition and ideology. In many cases however, these built manifestations of intent fail to meet the expectations of both client and architect: circumstances of time, money, space and other shortcomings are usually to blame. But often a dearth of vision or dedication to an idea – or an ideal – by any of the parts, removes from a work of architecture any kind of significance to the society of its present and the history of its future. 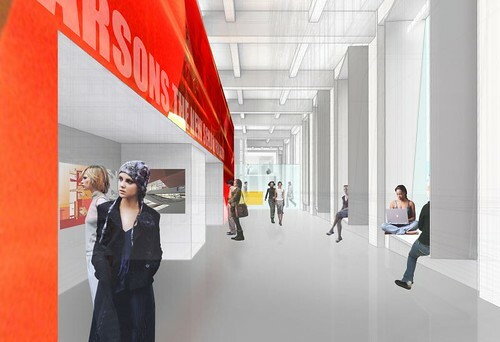 Such is the case of the Sheila C. Johnson Design Center, a Lyn Rice Architects (LRA) project for Parsons the New School of Design, in New York City. This lobby, auditorium, archive, gallery and meeting room complex is, since early 2008, the school’s new urban showcase. 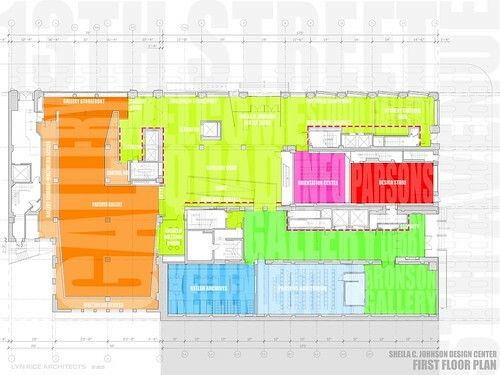 According to a recent press release, it underscores the New School’s “commitment to the new”: a lengthy enumeration of the facility’s features, this press release fails to include one important element of the Center’s design that can also be easily overlooked in an architecture review. Although typography can be seen as something foreign to both the practice and critique of the discipline, in this case it deserves closer inspection and scrutiny. An analysis of typography in this project is relevant due to its sheer physical presence in the space, but also because of the process behind its selection and implementation, which speaks volumes about the architects’ dedication to an idea, but even more about the relations between a design, its architect and its commissioner. I didn’t make much of it on my first visit to the Center: I was there to see “the architecture”. The new space seemed a clear improvement from what was there before – the school longed for something new, and the architects delivered. My personal highlights were the new bay windows bringing the street inside, the padded walls of the archive and the clever cable solution in the gallery, which allows for long cables to be hidden from visitors’ sight, while being easily accessible to technicians. But there were already signs in the building that “new” was no longer great: messy scribbles on the auditorium slate wall; a critique wall not moving as it should; the three “super-sized graphic” walls and the complex process of selection and public exhibition of student work they entail. All this made me question the intention vs. the application of some of the building’s features. Such was also the case of the bark wall; initially planned as a “vertical garden wall” to be designed by the French architect Patrick Blanc, it was rejected by one of the School’s board members. Another wall of the lobby was to have an artwork by Ben Rubin (of New York Times’ building lobby fame) but was left blank. The typography, and particularly the typeface used in the building, may have also been, like these two examples, a symptom of the architects’ intent not matching by the commissioner’s agenda – or vice-versa. Or was it? Huge aluminum capital letters lay perpendicular to the school’s façade, giving the school an only-readable-from-below-canopy instead of the big-letter-sign one could expect. Inside, the names of rooms – or rather, the names of the people who paid for them – are found embossed in plaster, cut in MDF or inlayed in bamboo and grey fabric. There are also fluorescent yellow vinyl letters and numbers on glass panes. The whole thing is full of type, and it’s all clad in one typeface: Impact. Designed by Geoffrey Lee in 1965 and re-released by Microsoft in 1996, Impact is today one of the most (over?) used typefaces in the world, together with Comic Sans, Arial, Curlz, and other fonts that come free with any computer operating systems. It is available to anyone with a personal computer and can be found from bunion therapy ads on the subway to thousands of MySpace pages. And there is nothing wrong with that: we all live in a free, typographically democratic society after all. Impact is also a favorite among architecture students. They love using it against renderings of their projects – the ones with jerky, badly photoshopped photos of catwalk models for scale – which can be found in every architecture school, including Parsons. LRA, too, love a bit of Impact: from the section dividers of their website to the plans, renderings and the actual Sheila C. Johnson Design Center building, they use it everywhere. But why here? Of all the thousands of typefaces created by experienced, talented type designers, why did LRA use not a cheap, but a free font in this building? A free, poorly designed typeface for such an important project and such a meaningful client – a design school, where typography is not only appreciated, but also taught? This answer would make most graphic designers cringe in revolt: How come Impact, the heavy font of the masses, the ugly typeface of desktop publishing and silly blogs (it’s the lolcats font! 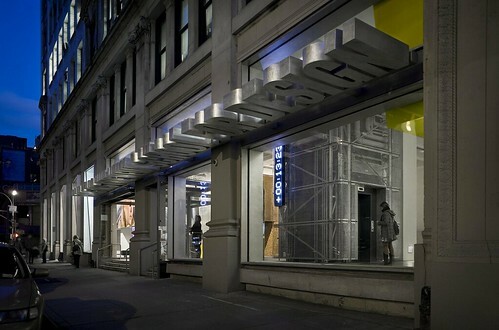 ), reemerges in Parsons as the ultimate “architectural element”? One would hope LRA could have used it as a poignant comment to the pervasiveness of Impact in 21st century vernacular graphics, or for any other clever reason a design critic could think of. But they just like it, didn’t look any farther, and went with it. Their client also went along with it, even when The New School had its whole visual identity redesigned in 2006 by the branding consultancy Siegel and Gale. The new logotype uses the typeface ITC Franklin Gothic to unite all its schools under one consistent brand: Parsons, concerned with the future (and present) typographic discrepancy in the building, then asked LRA to consider using this typeface instead of Impact. LRA not only didn’t change their minds, but convinced their client to trust their graphic instinct: “I believe it does not hurt to inject some variation and to create a slightly modified graphic identity at the Johnson Design Center – its own strong identity – as opposed to being too much of a ‘branded space’”, said Lipka. But where does “space identity” end and “branded space” begin? The use of typography by LRA in the Sheila C. Johnson Design Center highlights two main issues. First, architects should not be handling type in the first place. They should be aware of their limitations, and work with better-qualified professionals in order to collaboratively create a solution that better expresses the client’s intent. It’s not that LRA went too far by pushing Impact in this project – they didn’t see, or go, far enough. Highly successful architect-graphic designer collaborations – such as Garth Walker‘s custom typeface for Urban Solutions + OMM Design Workshop’s Constitutional Court in Johannesburg or Paula Scher‘s typographic extravaganza for Kaplan Gaunt DeSantis’ Lucent Technologies Center for Arts Education – prove that architects can play well with others. LRA do not. By working on their own and ignoring other design disciplines, they not just made a mediocre design gesture and post-justified it to the school board. They sent the worst possible message to designers and architects, professionals and students, inside and outside Parsons. Secondly, the whole process exposes the shortsightedness of the Center’s own commissioner. Instead of – as stated in that seemingly innocuous press release, but aren’t these things declarations of intent? – underscoring The New School’s “commitment to the new”, Parsons visibly has no idea of what it wants to commit to. So instead of boasting an innovative, inspiring typographical addition to its new building, it accepts, as part of its built ideal, a mere architectural afterthought. It gained a new, shiny, impactful (pun intended) “urban quadrangle”, but lost a (historic?) chance to express an idea, a vision, of what it has been teaching for over 100 years. Parsons too didn’t see, or go, far enough in its commitment to an ideal: instead of championing design (architectural, product, communication, fashion, et al) as the ultimate collaborative, inclusive, forward-thinking discipline of the 21st century, it seems to still foster a profession tied to hierarchy, superficial knowledge and ego. If the Sheila C. Johnson Design Center ever makes architecture history, it will do so with a bitter footnote. This writing assignment for Alexandra Lange’s “Architecture and Urban Design Criticism” course consisted in writing a 1200-word architecture review of Lyn Rice Architect’s Sheila C. Johnson Design Center, of which we had a guided tour by one of the firm’s partners, Astrid Lipka.